Sometimes something catches my eye as I walk past the bricks when I walk into the museum. Its odd, like I'm SUPPOSE to see it. 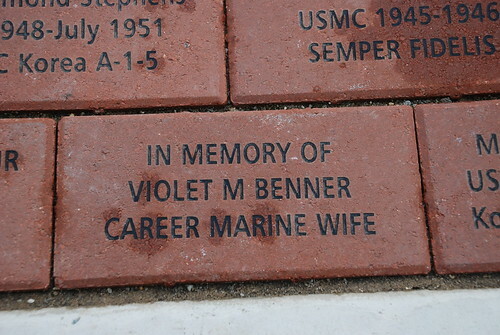 When I noticed this brick, I knew I needed to take a photo of it to share with my military spouse friends. What an honor this Marine paid to his wife - - or her children paid to her. I hope they complimented her on her sacrifices and accomplishments while she was living. So often we take people for granted, until they are gone and wish we had told them how much we appreciated what they had done for us. How thankful we were for how they supported us. If you have a military spouse in your life, tell her (or him) how much you appreciate them. I know the day is over but I had to sort through over 1000 pictures to find this shot. Grrr, I need to organize my photos better. Having once been (for a very short stint) a military spouse myself, I have an idea of what you guys go through. You all really keep it all together, make sure the bills are paid, the housework AND yard work are done, the kids are fed and are doing well in school. You often pack the house up alone and unpack it alone. You have to be the strong one for the family, for your friends. Encourage your spouse, basically make it so they can do their job defending America and not have to worry about anything else. You persevere through deployments as well as the long work-ups to the deployments. You walk on eggshells after the deployment as everyone figures out the pecking order again. Just like your soldier, airman, sailor or marine, you work 24/7. You don't get a day off. You worry when the news on CNN is bad, and calmly go about your day as you wait a call or e-mail letting you know they are o.k. You pray for peace harder than anyone else. You are there for your fellow military spouses in times of births, sickness and death. You guys are amazing. That's nice! I didn't know we had a special appreciation day. It's a tough life, that's for sure. But then there are days where you swell with pride and know exactly why God led you down this path. What a nice gesture for a military spouse to be remembered that way!